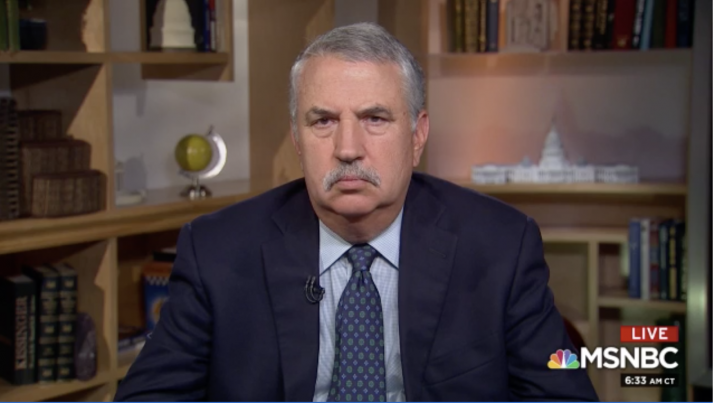 Earlier this week during an appearance on MSNBC’s “Morning Joe” program, New York Times columnist Thomas Friedman pleaded with viewers to ‘vote Democrat’ in the midterm elections in November. Failure to do so, he warned, would lead to the destruction of our democracy. Or something like that. Labeling President Donald Trump the “greatest threat to our democracy,” Friedman may sound like just about every other unhinged Left-wing kook journalist in America today — and he does. But the ongoing cacophony of the unhinged Pravda media is what really threatens our democracy. “Look, these midterms are soon to be upon us,” Friedman said, almost breathlessly. “And I have one piece of advice for people: You have to vote for a Democrat because — and I say that as someone who, you know, I have very conservative issues on a lot of things. I’m free trade. I’m pro-globalization, pro-business. So is the problem just that Trump is ‘violating norms’ or that he’s really violating ‘Washington norms?’ Because if it’s the latter, there are tens of millions of Americans who are ready to join him. Trump is an unconventional president, to be sure, but that’s his appeal to his loyal core of supporters. Americans were tired of reheated, blow-dried RINOs running as Democrat-lite candidates who would, if elected, ensure that “business as usual” was the order of the day in Washington. But Pravda journalists like Friedman are attempting to frame Trump’s criticism of that outlandish and possibly illegal behavior as the primary threat to our country’s survival, not the act of violating our trust with a bogus “counterintelligence” investigation based on no evidence whatsoever. He frames Trump’s criticism as an ‘attack on our institutions,’ when it fact, all Trump is saying is that the people within those agencies who ordered an unfounded, politically motivated probe of his campaign were wrong. Not the ‘institution’ of American federal law enforcement. It’s not a distinction without a difference. Trump has repeatedly called out those he thinks are guilty — Comey, Clapper, Brennan, Rice, Yates, Strzok, and even Obama — not the entire agencies. And if they have misbehaved or even behaved illegally, shouldn’t they be called out? Of course they should. Not only should they be called out but those who were responsible should be identified, indicted, and — if found guilty — punished. These institutions have damaged themselves by allowing themselves to be politicized by the most politically motivated, underhanded president in modern history. By criticizing Trump for calling out the corruption rather than criticizing the corruption itself, Pravda hacks like Friedman are exacerbating the already substantial mistrust among the American electorate by perpetuating a lie. They’re doing Vladimir Putin’s counterespionage work for him by helping to sow distrust in the system. And that makes them an enemy of the American people, not protectors of freedom. Hiding behind the First Amendment to help our enemies subvert our legitimate government is every bit as treasonous as working directly for the Kremlin. Read more about treasonous behavior like this at Treason.news.